Forms are central to an HR administrator's capacity since they ferry and centralize employees’ information and identity. This form builder empowers these HR administrators to customize their forms and does the heavy-lifting of data entry. Workflows is where users can create automated actions for each form. As the lead designer for this project I worked closely with the customer support team to learn what functions were needed and what made the system too confusing for users. The system had to be presented in a simple manner. I introduced a system that can be looked at in groups of information rather than an entire system all at once. The form builder and it's workflows used to be used entirely by our internal customer support team. 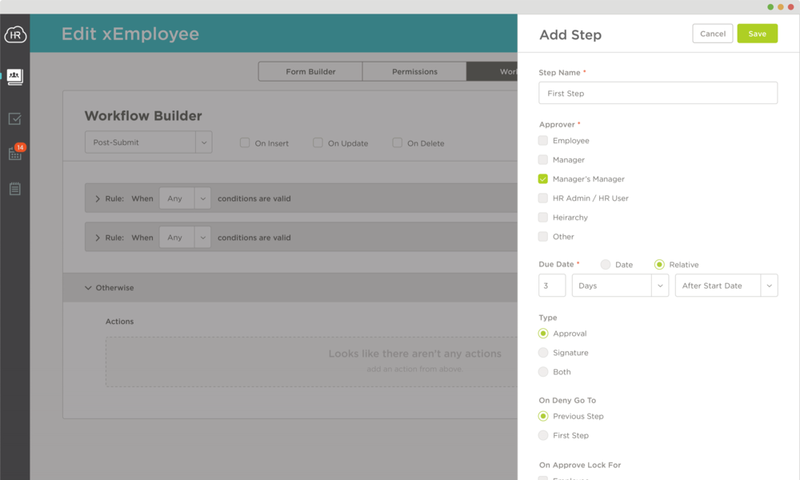 Forms and workflows were being built by an internal team at HR Cloud and we needed to create a design that is simple enough for customers to create their own forms with contiguous rules. The existing system was too confusing for any users that don't understand any code languages. 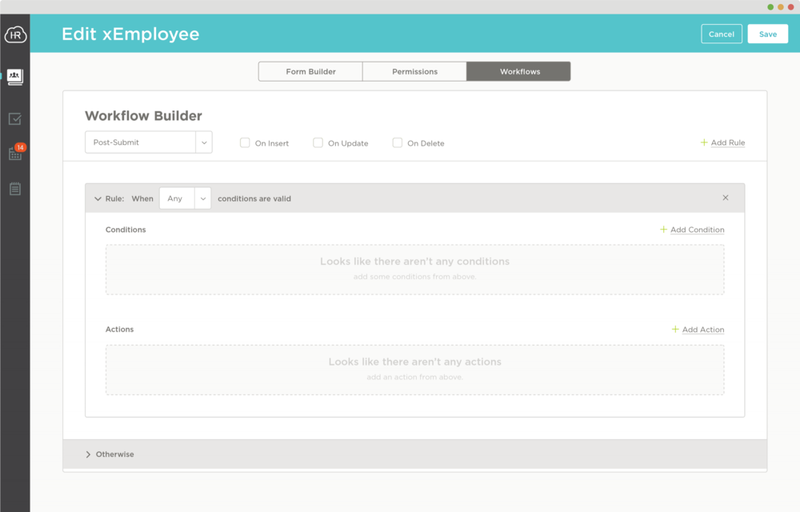 The form builder lacked the complexity HR administrators needed. Designs had to be presented in colloquial terms for easier understanding. I had to work closely alongside the product team to meet form builder's specific feature requirements. I white-boarded and sketched out the numerous possible user flows to cement all the specifics. Not only did I collaborate with developers to push what was technically possible on our framework, but also worked with the customer support team to get their input on how our customers use the system. Workflows exist within each custom form. Keeping the two closely related allows for better understanding of the specific fields on each form that can have rules applied to them. With a system as complex at form builder workflows, I had to create a system for HR Cloud that had not previously existed. The ability to expand and collapse rules to clean up a complex view enables users to focus on one item at a time. Step settings are established in a small flyout which flies in from offscreen. This allows users to focus on establishing the condition settings while all else falls to the background while it is not needed. Even minor details deserve close attention, because attention to each and every detail is key to success in making human-computer interaction easy to use. These micro-moments are what ultimately guides a user through a flow in an intuitive and effective way. Allowing users to add new steps to a process from within the step frees up users to complete what they need within the flow. This way users don't have to leave the page to create what they need outside to then return. Users have the ability to completely customize not only the actions themselves, but also more specific traits within each action. Shown below is where users can customize the exact email that will be sent based on their specified conditions. By using the product internally at first, the company as a whole provided very useful feedback and user data to help us iterate better versions of the form builder and workflows. By breaking up the process into digestible chunks, we reduced information overload which allowed us to open this feature up to use by our customers.